May is the month of GURPS and Munchkin, with several supplements and games hitting shelves! GURPS is back with the new printing of GURPS Basic Set! An RPG is nothing without its characters, and GURPS Basic Set: Characters gives players nearly limitless combinations of options. With over 400 advantages and disadvantages, and over 350 skills, spells, and techniques, players will be able to customize every aspect of their avatar. You can recreate a classic hero, or create a cyberpunk hacker from the future, the choice is yours! GURPS Basic Set is the 4th edition of our classic RPG, and is the perfect introduction to the exciting world of GURPS. This is the only book you need to play. 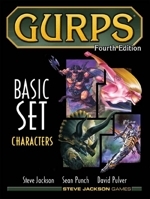 GURPS Basic Set: Characters is Book 1 of the two-volume GURPS Basic Set. 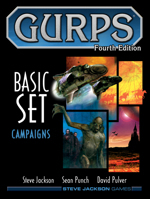 Enhance your GURPS universe with GURPS Basic Set: Campaigns! This book is designed for Game Masters who want to add a bit more life to their campaign settings. Advanced players can take advantage of the new technology, animals, monsters, and even the cross-world setting Infinite Worlds! This is the perfect way for players getting into GURPS to grow their settings and stories, and create a deeper experience. This is Book 2 of the two-volume GURPS: Basic Set. Only Book 1 is necessary to play, Book 2 is to help Game Masters expand their game. Another month, another new take on a classic Munchkin game! 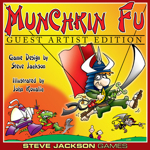 This time it's Munchkin Fu Guest Artist Edition, with art by John Kovalic. You may know him from...oh I don't know, he's done something with us. Oh yeah, MUNCHKIN! Oddly enough, John wasn't able to contribute art to the original Munchkin Fu, so we finally tied him up...I mean asked him nicely, and he was more than happy to help! Relive your favorite hokey martial arts movies, with all new art for 168 cards, board and standies. HI-YAAAAAH! Here be dragons? Well, here come the Knights! The Munchkin Knights may not be traditional knights of the round table, but sometimes the hero the kingdom needs is Boogie Knight. Ian McGinty is back for art after doing his own Munchkin Guest Artist Edition as well. So grab a Knight Cap: It's time to save the kingdom! And remember, 'tis but a scratch! Munchkin Knights is a non-random booster pack expansion for Munchkin. A Munchkin base set is required to play. Do you ever feel like your other games don't have enough Munchkin flair? Worry not! Our Munchkin Meeples let you add some iconic monsters to your games, in Mega-Meeple and Non-Mega-Meeple size. And of course you can use them with Munchkin as well! Players can spend Meeples to get more treasure, run away from a battle, or even kill monsters. Don't kick in a door again without a pocket of Munchkin Meeples! Preorder these items and more at your Friendly Local Game Store!